removes accumulated grease and dirt, with a band brush, from bogies and underframe of railway rolling stock, preparatory to repair. wheels trolleys carrying dismantled parts of axle boxes, etc., to tanks of boiling soda water, used for removing dirt and grease; closes door of chamber, lowers trolley into tank by means of electric hoist and opens and closes valves for admission of water and steam to tank, or assists winch driver (950) to dip articles to be cleaned; may also swill articles on removal with water from hose. demolishes railway wagons by unscrewing, removing bolts, etc., or breaking up by force, when necessary, with hammer and chisel; sorts out parts that are suitable for re-use. 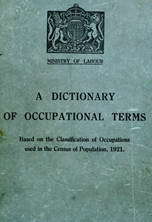 does general unskilled work in carriage or coach building works; fetches and carries material, holds up work, hands tools, etc. laces cord through holes in rear mudguard and hub fitting to form dress guard on rear wheels of ladies' bicycles; sometimes does fancy knotting in more elaborate lacings. general term for workers fitting rubber tyres, solid or pneumatic, to wheels of perambulators, bath chairs and similar vehicles, including solid tyre fitter, pneumatic tyre fitter q.v. general terms for workers fitting solid or pneumatic tyres to motors, lorries, cycles, aeroplanes, and other similar vehicles; for pneumatic tyres, fits outer cover over wheel rim, inserts inner tube, adjusts valve, completes fitting of outer cover and inflates with foot or power-driven pump and pressure gauge; for solid tyres, fits solid or cushion rubber tyres to rim with special rubber cement; twists together ends of wire, in wired-on tyres; cf. tyre pressman (658); sometimes specifically designated, e.g. cushion tyre fitter, cycle tyre fitter, motor tyre fitter, solid tyre fitter, pneumatic tyre fitter. as for carriage works labourer.